This is the second of two columns dedicated to the proper use of over-the-counter drugs used, especially during the “cold and flu” season. First and foremost, consumers must read and comprehend the information provided on the labels of all over-the-counter (OTC) medications before taking the drug themselves and before giving the drug to a loved one, especially a child. According to the Centers for Disease Control, approximately 200,000 children (17 years old and younger), visit emergency departments each year due to adverse drug events, including OTC drugs, and children less than 5 years old are more vulnerable than older children. Dosing recommendations for this age group have not been established by the Food and Drug Administration. Many OTC remedies contain numerous ingredients which can increase the risk of an accidental overdose when using multiple products or when used in conjunction with prescription medication. Most product labels are vague about the hazardous consequences resulting when these drugs are given to infants and toddlers. There is no cure for the common cold and there is no evidence that OTC cold remedies are more effective than placebo in children under 2 years of age. The American Academy of Pediatrics recommends alternative solutions to alleviate the symptoms of a child’s cold: (1) To loosen mucous in the nose, use saline nose drops or a cold-air humidifier, (2) To clear nasal congestion, use a rubber suction bulb. If parents have patience and allow several days, the child’s symptoms usually subside. If your child frequently experiences a runny nose, earache, or sinus infection, food intolerances can be the culprit. Avoiding provoking foods such as dairy, wheat, corn, and tree nuts often affords relief to the child with food allergies. “Pharming” is when teenager’s use prescription and OTC medications to get “high.” OTC cold remedies containing Dextromethorphan (DXM) are popular recreational drugs for children between the ages of 13 and 16 to induce the sensation of intoxication and even hallucinations. A survey conducted by the Partnership for a Drug-Free America concluded that 1 out of 11 teens has used OTC cold remedies for a recreational “high”. DXM is readily available (probably in your medicine cabinet), inexpensive, and not illegal. DXM is considered a “drug of concern” by the Drug Enforcement Agency but there are no legal restrictions except that OTC medications containing DXM are now stored behind the counters of retail stores . DXM is an ingredient in more than 120 OTC cold remedies including: Robitussin, Nyquil, and Vicks Formula 44. Chemically similar to morphine, DXM has been added to cough syrups and cold medications since the 1970’s. Coricidin HBP Cough and Cold Tablets contain a significantly higher dose of DXM providing an easy and convenient “high” after the ingestion of only a few pills. In addition to DXM, OTC diet pills, sleep aids (Tylenol PM, Excedrin PM, Sominex), and motion sickness medication (Dramamine) are also abused by teenagers. Diet pills have the potential to produce a “high” and Dramamine causes hallucinations when recommended dosages are exceeded. The abuse of sleep aids can result in narcolepsy. As the frequency of usage increases, teens are at risk of developing physical and psychological dependence to these drugs. Today’s teens are more likely to abuse OTC medications because of the plethora of information available. Advertisements in magazines, newspapers and on the television have portrayed OTC drugs as safe or harmless. The internet provides an abundant supply of information to the computer savvy teen. Children have access to knowledge about what kinds of OTC remedies to buy for a “high” and exactly how much of the drug should produce the desired effect. The effects of OTC medications can be enhanced and potentially fatal when combined with other OTC drugs, alcohol, or prescription medications. Fortunately, many of these medications are now only available “behind-the-counter” and some states limit how much a person can purchase each month. Children abuse drugs to gain social acceptance or to alleviate stress from school, friends, and family. Be alert for a child that may be abusing OTC drugs if drugs are missing, grades decline, behavior changes, or eating/sleeping is disrupted. Potential OTC drug abuse can be prevented by: conducting regular drug inventories, communicating with and listening to your children, and establishing well-defined family rules to provide your teen with the information necessary to give the appropriate responses when confronted with recreational OTC drug abuse. Contact your physician if you suspect a potential OTC abuse problem in your child or loved one. 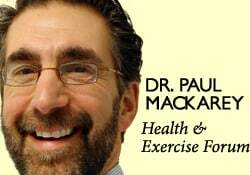 Read “Health and Exercise Forum” by Dr. Paul J. Mackarey every Monday in The Scranton Times-Tribune. Dr. Mackarey is a doctor of orthopedic and sports physical therapy with offices in downtown Scranton. Dr. Mackarey is an associate professor of clinical medicine at GCSOM.